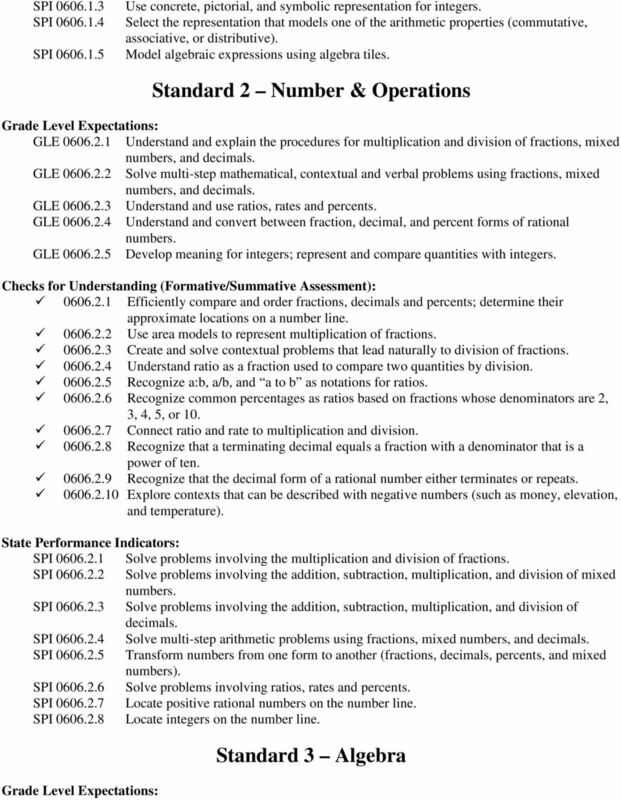 Download "Tennessee Mathematics Standards 2009-2010 Implementation. Grade Six Mathematics. 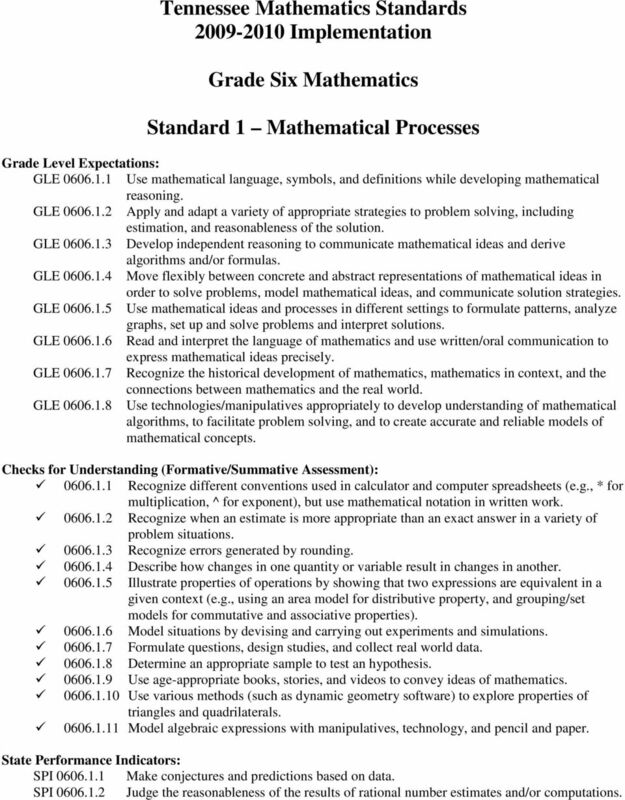 Standard 1 Mathematical Processes"
1 Tennessee Mathematics Standards Implementation Grade Six Mathematics Standard 1 Mathematical Processes GLE Use mathematical language, symbols, and definitions while developing mathematical reasoning. GLE Apply and adapt a variety of appropriate strategies to problem solving, including estimation, and reasonableness of the solution. GLE Develop independent reasoning to communicate mathematical ideas and derive algorithms and/or formulas. GLE Move flexibly between concrete and abstract representations of mathematical ideas in order to solve problems, model mathematical ideas, and communicate solution strategies. GLE Use mathematical ideas and processes in different settings to formulate patterns, analyze graphs, set up and solve problems and interpret solutions. GLE Read and interpret the language of mathematics and use written/oral communication to express mathematical ideas precisely. GLE Recognize the historical development of mathematics, mathematics in context, and the connections between mathematics and the real world. GLE Use technologies/manipulatives appropriately to develop understanding of mathematical algorithms, to facilitate problem solving, and to create accurate and reliable models of mathematical concepts Recognize different conventions used in calculator and computer spreadsheets (e.g., * for multiplication, ^ for exponent), but use mathematical notation in written work Recognize when an estimate is more appropriate than an exact answer in a variety of problem situations Recognize errors generated by rounding Describe how changes in one quantity or variable result in changes in another Illustrate properties of operations by showing that two expressions are equivalent in a given context (e.g., using an area model for distributive property, and grouping/set models for commutative and associative properties) Model situations by devising and carrying out experiments and simulations Formulate questions, design studies, and collect real world data Determine an appropriate sample to test an hypothesis Use age-appropriate books, stories, and videos to convey ideas of mathematics Use various methods (such as dynamic geometry software) to explore properties of triangles and quadrilaterals Model algebraic expressions with manipulatives, technology, and pencil and paper. SPI Make conjectures and predictions based on data. 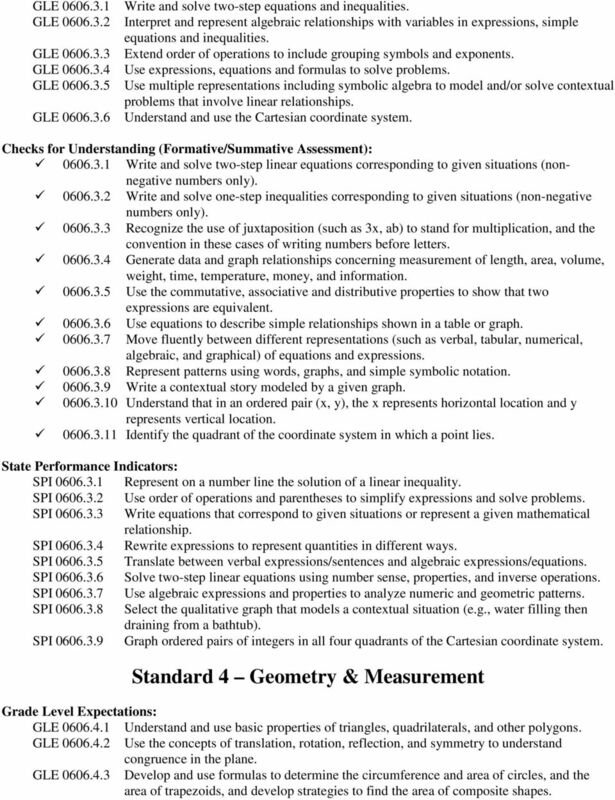 SPI Judge the reasonableness of the results of rational number estimates and/or computations. 3 GLE GLE GLE GLE GLE GLE Write and solve two-step equations and inequalities. Interpret and represent algebraic relationships with variables in expressions, simple equations and inequalities. Extend order of operations to include grouping symbols and exponents. Use expressions, equations and formulas to solve problems. Use multiple representations including symbolic algebra to model and/or solve contextual problems that involve linear relationships. Understand and use the Cartesian coordinate system Write and solve two-step linear equations corresponding to given situations (nonnegative numbers only) Write and solve one-step inequalities corresponding to given situations (non-negative numbers only) Recognize the use of juxtaposition (such as 3x, ab) to stand for multiplication, and the convention in these cases of writing numbers before letters Generate data and graph relationships concerning measurement of length, area, volume, weight, time, temperature, money, and information Use the commutative, associative and distributive properties to show that two expressions are equivalent Use equations to describe simple relationships shown in a table or graph Move fluently between different representations (such as verbal, tabular, numerical, algebraic, and graphical) of equations and expressions Represent patterns using words, graphs, and simple symbolic notation Write a contextual story modeled by a given graph Understand that in an ordered pair (x, y), the x represents horizontal location and y represents vertical location Identify the quadrant of the coordinate system in which a point lies. SPI Represent on a number line the solution of a linear inequality. SPI Use order of operations and parentheses to simplify expressions and solve problems. SPI Write equations that correspond to given situations or represent a given mathematical relationship. SPI Rewrite expressions to represent quantities in different ways. SPI Translate between verbal expressions/sentences and algebraic expressions/equations. SPI Solve two-step linear equations using number sense, properties, and inverse operations. SPI Use algebraic expressions and properties to analyze numeric and geometric patterns. SPI Select the qualitative graph that models a contextual situation (e.g., water filling then draining from a bathtub). SPI Graph ordered pairs of integers in all four quadrants of the Cartesian coordinate system. Standard 4 Geometry & Measurement GLE Understand and use basic properties of triangles, quadrilaterals, and other polygons. GLE Use the concepts of translation, rotation, reflection, and symmetry to understand congruence in the plane. GLE Develop and use formulas to determine the circumference and area of circles, and the area of trapezoids, and develop strategies to find the area of composite shapes. 4 GLE Develop and use formulas for surface area and volume of 3-dimensional figures Investigate the sum of the angles in a triangle and a quadrilateral using various methods Relate the sum of the angles in a triangle to the sum of the angles in polygons Verify the basic properties of triangles and quadrilaterals using a protractor and ruler Classify triangles by side lengths (scalene, isosceles, and equilateral) and angle measure (acute, right, obtuse, isosceles and equiangular) Model and use the Triangle Inequality Theorem Use the properties of interior and exterior angles of polygons to solve problems Work with transformations in a plane and explore their meanings through drawings and manipulatives Understand scaling, dilation and their relation to similarity Analyze the differences between congruence and similarity Describe the effect of a transformation on a 2-dimensional figure and the resulting symmetry Relate the circumference of a circle with the perimeter of a polygonal figure Derive the meaning of Pi using concrete models and/or appropriate technology Understand the relationships among the radius, diameter, circumference and area of a circle, and that the ratio of the circumference to the diameter is the same as the ratio of the area to the square of the radius, and that this ratio is called Pi Relate the area of a trapezoid to the area of a parallelogram Find lengths given areas or volumes, and vice versa Solve contextual problems involving area and circumference of circles, surface areas and volumes of prisms, pyramids, cones, and cylinders Use manipulatives to discover the volume of a pyramid is one-third the volume of the related prism (the heights and base areas are equal) Use manipulatives to discover the volume of a cone is one-third the volume of the related cylinder (the heights and base areas are equal). SPI Identify, define or describe geometric shapes given a visual representation or a written description of its properties. SPI Find a missing angle measure in problems involving interior/exterior angles and/or their sums. SPI Solve problems using the Triangle Inequality Theorem. SPI Calculate with circumferences and areas of circles. SPI Determine the surface area and volume of prisms, pyramids and cylinders. SPI Given the volume of a cone/pyramid, find the volume of the related cylinder/prism or vice versa. 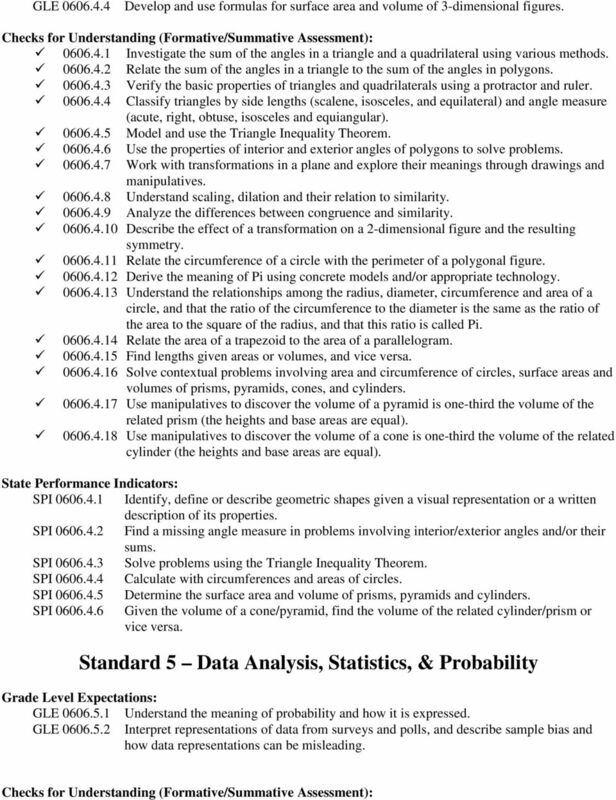 Standard 5 Data Analysis, Statistics, & Probability GLE Understand the meaning of probability and how it is expressed. GLE Interpret representations of data from surveys and polls, and describe sample bias and how data representations can be misleading. 5 Understand that the probability of an event is a number between zero and one that expresses the likelihood of its occurrence Identify the probability of an event as the ratio of the number of its actual occurrences to the total number of its possible occurrences Express probabilities in different ways Understand the difference between probability and odds Analyze a situation that involves probability of an independent event Estimate the probability of simple and compound events through experimentation or simulation Apply procedures to calculate the probability of complimentary events Connect data sets and their graphical representations (such as bar graphs, circle, graphs, and stem-and-leaf plots) Determine the sample space for a given situation Distinguish between a random and nonrandom sample Select the appropriate measure of center to describe a data set Predict the characteristics of a population based on the analysis of sample data. 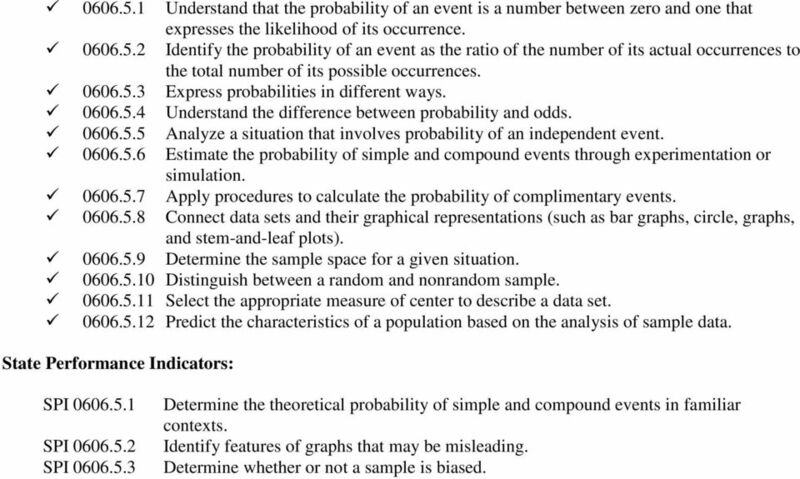 SPI SPI SPI Determine the theoretical probability of simple and compound events in familiar contexts. Identify features of graphs that may be misleading. Determine whether or not a sample is biased. Maths Targets Year 1 Addition and Subtraction Measures. N / A in year 1. Saxon Math 7/6 Class Description: Saxon mathematics is based on the principle of developing math skills incrementally and reviewing past skills daily. It also incorporates regular and cumulative assessments. 6.N.1. 6.N.2. 6.N.3. Number Demonstrate an understanding of place value for numbers greater than one million less than one-thousandth [C, CN, R, T] Solve problems involving large numbers, using technology. Read and write numbers to at least 1000 in numerals and in words. Year 1 Maths - Key Objectives Count to and across 100 from any number Count, read and write numbers to 100 in numerals Read and write mathematical symbols: +, - and = Identify "one more" and "one less"
Grade 7. Suggested Instructional Time. Grade 7: Suggested Sequence for CMP3 1. Unit 1 Accentuate the Negative: Integers and Rational Numbers. 1 st What is mathematics? 1A: Understand numbers, ways of representing numbers, relationships among numbers, and number systems.